So I made a birthday cake for one of my coworkers. A delicious, rich, chocolate salted caramel creation. But I ended up with extra dark chocolate frosting... Does this ever happen to you?? The weather is finally warm and feeling like summer is just around the corner, but it sure feels like it took its sweet time. (Get it? Sweet?) Ever since a really warm spell we had in March, I have been done with the cold. So when single digit temperatures appeared again, I decided to make this fall inspired recipe to beat the cold. 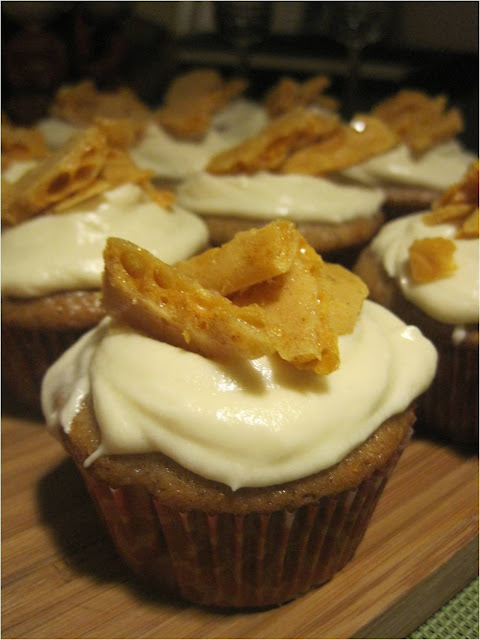 Beer and honey spice cupcakes with brown sugar cream cheese frosting and honey spice sponge toffee.